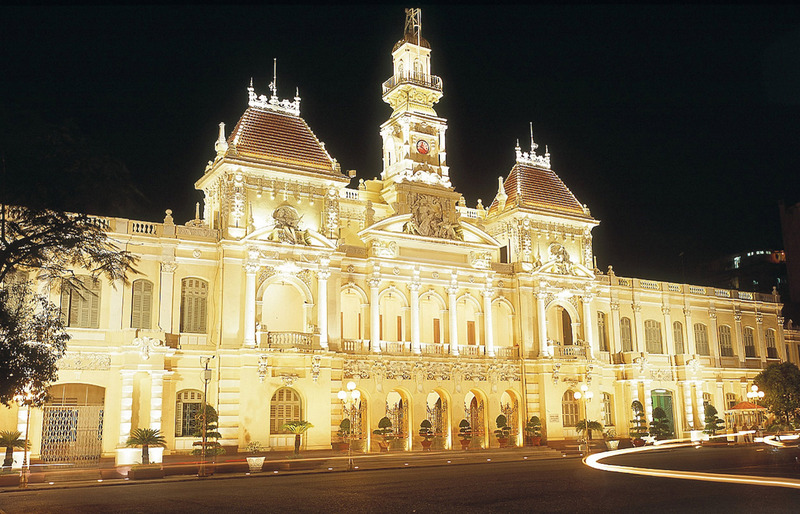 Tour starts in Ho Chi Minh City, “commonly known as Saigon”, is a city in southern Vietnam. It’s also known for its French colonial landmarks, including Notre-Dame Cathedral, made entirely of materials imported from France, and the 19th-century Central Post Office. This 16 days program is the best average time for the travelers who have limited time yet still want to discover the real Việt Nam & Cambodia. The itinerary neatly takes and brings in the most interesting places and attraction sites in the south of Cambodia and Vietnam. It’s the perfect introduction to one of Asia’s most fascinating countries. Day 15: Phu Quoc (B / … / …) | Free day on the beach. Day 16: Departure from Saigon (B) | Transfer to airport for flight to Saigon, the return flight home. Arrive at Tan Son Nhat and airport transfer to your hotel. Afternoon free. Your program includes the Reunification Hall, formerly known as the Presidential Palace it was towards this modern building that North Vietnamese tanks seized on the morning of April 30 1975, as Saigon fell. 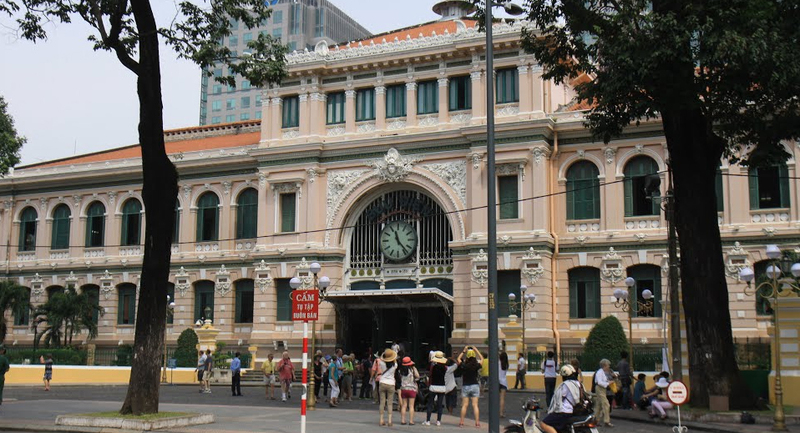 From there stroll (your vehicle will be available at all times) to the major sights of colonial Ho Chi Minh City: the Old Saigon Post Office, Dong Khoi Street (formerly Rue Catinat), Continental Hotel, Opera House and City Hall. After this historical visit continue to the War Remnants Museum where exhibition halls display imagery of ‘American’ war. Then, you will visit Việt Nam’s only Chinatown, Cho Lon. We take a walk through a herbal medicine street to learn about different types of traditional Chinese medicine, and finally visit the bustling Binh Tay market. Overnight at hotel in Saigon. Transfer by car to Cai Be on a 2 hours trip, then start boarding a private motorized boat to go past Cai Be colorful floating market. You also stop at different workshops where rice paper, coconut candy and pop-rice, pop-corn are made…to have hands-on experience and taste all kinds of products. One of the highlights of the tour is taking rowing boats through narrow canals, exposing to the lush green scenery of the delta and enjoy the peaceful atmosphere. Lunch is served at a local home. After lunch, we can walk along the village, then a leisurely bike along village paths to expose to local daily life. Check in the local Homestay for relaxing, then walking around the village to interact with the local people. You can go to their kitchen and help the owner arrange dinner. After diner you can enjoy cup of tea or some local “moonshine” rice wine when talking to the host about the culture, people, and history of this Island. Overnight in their house. The highlight of the tour today is the early bird visit to Cai Rang, the biggest floating market in the Mekong delta. The criss-crossing canals system connecting among rivers has created a very easy and popular means of transportation : by boats. 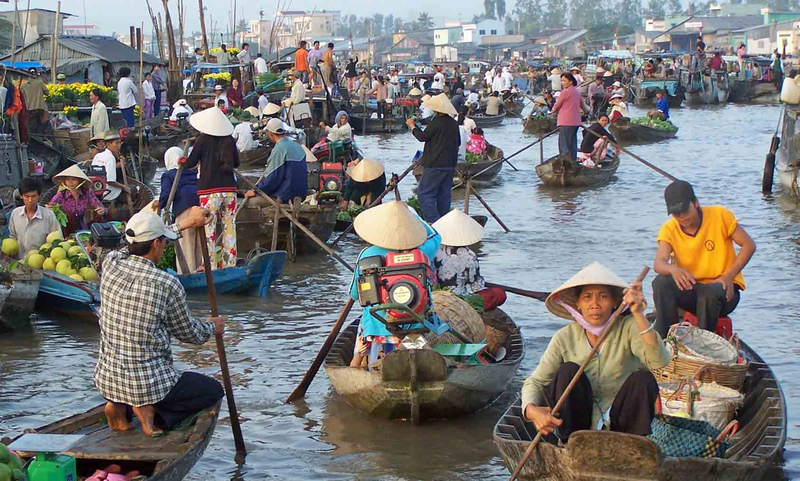 And thus, floating markets are commonly held on the daily basis, at the intersection of rivers and cannals. The market often starts as the day breaks and lasts a few hours. From the fruits, meat, shrimps, fishes until the lottery tickets, coffee …are all available here. You can stop over at one of the trader ‘s boat and go up to the sun deck to get pictures with the whole market and try some tropical fruits . The tour continues to Rau Ram canal for a walking tour along the village road to see the activities of local life and stop to visit The rice noodle workshop to learn how to make rice noodle…, then a farmer’s family. Cruising back to the hotel in late morning before continue by car to Chau Doc town. Check-in hotel. Evening at leisure. Have an early bird breakfast then board the hydrofoil from Chau Doc to Phnom Penh, upstream the mighty Mekong river. You will go past many floating fish farms along the way till the border. Check in and overnight in Phnom Penh. The Royal Palace was built by the French in 1866 on the site of the old town. The main building of the compound is the Throne Room. It was built in 1917 in traditional Khmer style and has a tiered roof and a tower of 59 meters, which is influenced by the temple of Angkor Thom Bayon. On the compounds of the Royal Palace, the Silver Pagoda is distinguished by its own way. The steps of the pagoda are Italian marble. Inside, the floor is made ​​up of over 5000 silver tiles , which together weigh nearly 6 tons. The pagoda houses a magnificent 17th century emerald Buddha statue and 90 kg gold Buddha studded with 9584 diamonds. Right next to the Palace, the National Museum in Phnom Penh was designed by the French historian Georges Groslier also following the traditional Khmer architecture. The museum itself is a landmark and masterpiece in the capital. Finally, visit Wat Phnom located on an artificial hill 27m high. It is believed that Daun Penh, a wealthy widow, found four Buddha statues in a tree Koki floating in the river. She built a small pagoda in 1373 to house the statues and in 1437 the King ordered the construction. Wat Phnom, which eventually led to the namesake of the city “Phnom Penh” of nowadays. Dinner at Bopha Phnom Penh riverside, included. Overnight in Phnom Penh. After breakfast, Leaving Phnom Penh and transfer to Siem Reap. En route, stop in and see spiders Skun local sales at the store. Continue your trip to Kampong Thom, and take the tour of the temples of Sambo Prei Kuh. Tour around the temples of the bicycle, providing on site. Late afternoon, go on the trip to Siem Reap and Kampong Kdei Bridge stop for about 15 minutes for some photos. Overnight at hotel in Siem Reap. Located 15 km east of Siem Reap, the group Roluos Temple is the oldest temple site in the province. It was once the seat of the Hariharalaya , the first capital of the ancient Khmer empire. Three main features are Roluos Preah Ko , Bakong and Lolei . Preah Ko and Bakong was built by King Indravarman. The three, however, the structures date from the late 9th century and represent the beginning of the classic period of Khmer civilization. Preah Khan is one of the great monuments is often given a pass for no obvious reason. Considered one of the largest structures of the Angkor Kingdom, Preah Khan was home to 100,000 officials and servants. Then continue to Neak Pean, an artificial island in Preah Khan Baray. Four interconnected lakes represent the four elements of nature; Water, Fire, Earth and Wind and entering the pool, it was believed that the disease could be cured. Traveling further east after Neak Pean and visit the small temple Ta Som, which was built by King Jayavarman VII in the late 12th century to honor his father. The tower is of particular interest because it has been superseded by a sacred figure and allows one of the most spectacular Angkor images. End of the day at Pre Rup, which was built as the state temple of King Rajendravarman in the late 10th century. 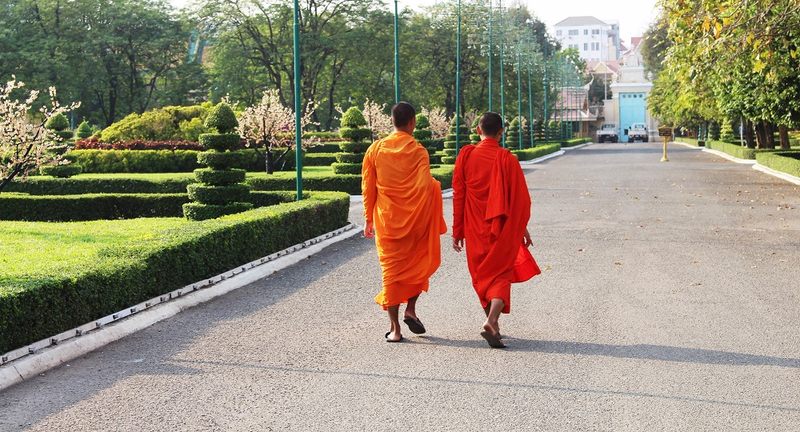 The temple provides a perfect opportunity to sunset after exploring many jewelry “forgotten” of the Khmer kingdom . Angkor Thom, which means “big city”. The city covers an area of 12​9km2 where many breathtaking monuments were built. South Gate offers great access to the city where the Victory Gate provides access to the east side, leaving the eastern gate, which is also known as the gateway to death beautifully intact in a very quiet the complex. The centerpiece of the city is the Bayon. Its most distinctive features are the 216 faces serene stone, apparently, facing all directions. Baphuon and Phimeanakas are structures built in the 11th and 10th century, respectively, and both were built in the style of the pyramid. Terrace of the Elephants is a 300 meter long terrace which has three main platforms and two subsidiaries. The south stairway is framed with three head elephant picking lotus flowers with their trunks. Similarly, the Terrace of the Leper King was built in the 12th century. The curious name of this terrace refers to a statue of the Leper King which is on the platform of the terrace. Return back town for lunch at a local restaurant. The rest of the afternoon is devoted to Ta Prohm, which is considered the most photographed in the Angkor temple complex. Built in the Bayon style between the late 12th and early 13th century, Ta ​​Prohm has been left almost intact by archaeologists. Trees growing on the ruins provide a mysterious feeling full of photogenic opportunities. Then visit Angkor Wat, built in the first half of the 12th century built by King Suryavarman II. The magnificent masterpiece construction, Angkor Wat is the largest religious monument in the world. Its perfection in composition, balance, proportions, reliefs and sculptures are one of the best in the world. 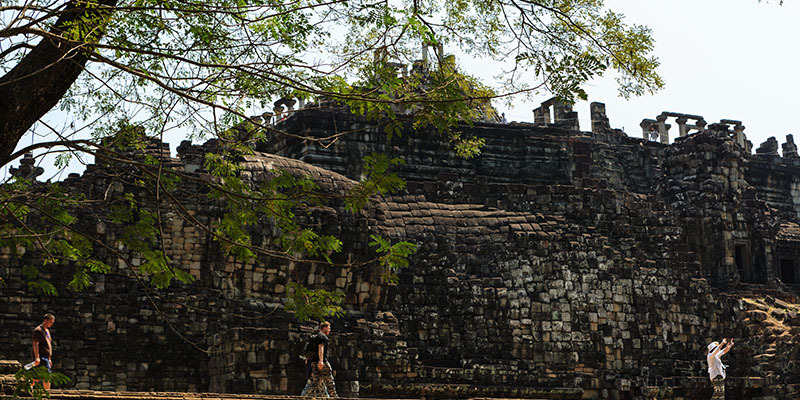 This temple is an expression of Khmer art at its most developed temple and reached its peak architectural development. Overnight at hotel in Siem Reap. Beng Mealea was built between the late 11th and the first half of the 12th century and is one of the largest collections in the Angkor region. The temple is considered as a standalone masterpiece located 40 km east of the main temples of Angkor along the ancient road connecting Angkor Kingdom with Prasat Bakan. The ruins of Beng Mealea are overgrown, allowing a true “experience of nature” In recent years a wooden track was built through the temple to allow people to see the beauty of the temple in the facility. However, most people risk the beaten track and find their own way through the temple allowing them to live the feeling that the first explorers must have felt when they discovered this magnificent structure. Later, continue to Kampong Phluk, located about an hour away. Aboard the arrival of a local boat and went for an exploration of this unique village on the floodplains of the Tonle Sap. Houses are built on stilts, some of them up to 10 meters above the ground. Visit one of the local houses and enjoy a simple picnic, overlooking the busy rituals on the lake. After lunch and witness the special way of life people have been used in Cambodia. A jewel of the Angkor area, Banteay Srei, dating back to the late 10 was the use of pink sandstone disc. century. The enchanting temple is the favorite of almost all the world. The special charm of this temple lies in its remarkable state of preservation , small size and excellence of decoration. After breakfast, transfer to Siem Reap for the flight to Phnom Penh. Arrive in Phnom Penh, meet your local guide to Phnom Penh to accompany you for the trip to Ta Keo, Kampot and Kep. During this trip you will be amazed with the temple of Tonle Bati, “Prasat Ta Prohm.” Tour around this mystical temple and the nearby lake before continuing your trip to Ta Keo and Phnom Da. Go straight to Kampot and overnight at hotel in Kampot. Koh Tonsay is located 4.6 km south of Kep and can be reached by boat from the port of Kep. Tourists are attracted by the beautiful white sandy beach overlooking the sea The sea is shallow and the bottom of the sea has a long gentle slope, Koh Thonsay excellent for swimming. At the bottom of the sea are a variety of corals, marine animals and plants which attract researchers and ecologists. Late afternoon, return back to KEP and night. After breakfast, transfer to the border and pass in Vietnam. The bus transfer to Ha Tien town after crossing the border. 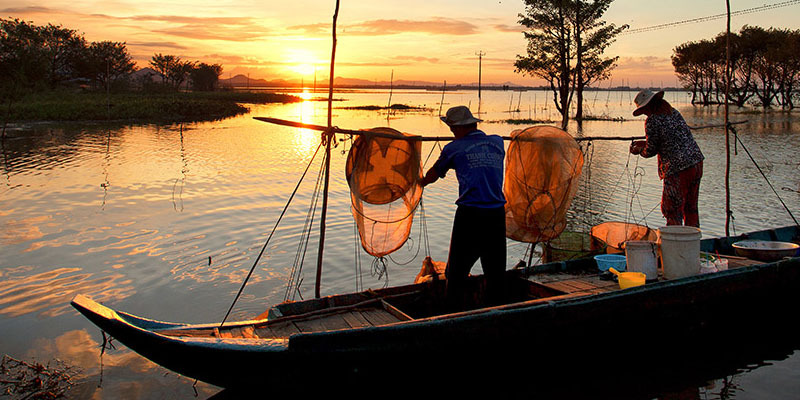 Ha Tien is a narrow strip of land near the sea and the Giang Thanh River. The pretty town has become a popular tourist destination and an easy access to the island of Phu Quoc item. Our driver will meet you at the arrival station and transfer to hotel for check-in. Rest of the day is free. Overnight at hotel in Ha Tien. Ha Tien is a small town with the old part is just outside the hotel. You can easily explore the city with a short walk through its center where beautiful colonial houses are still in good conditions. You can also stop by the coffee float the river to try the popular local drink while enjoying the beautiful view of the beautiful city. The driver will then take you to visit Mac Cuu tomb, the founder of Ha Tien, to learn about the history of the region and how it became part of the territory of Vietnam. A stop at Thach Dong cave will give you the opportunity to obtain the panoramic image of the city. Back to town to check before leaving Ha Tien to Phu Quoc island by hydrofoil at 13:30. Transfer to airport for flight to Saigon, the return flight home. – Any other service that are not mentioned in the inclusion above. 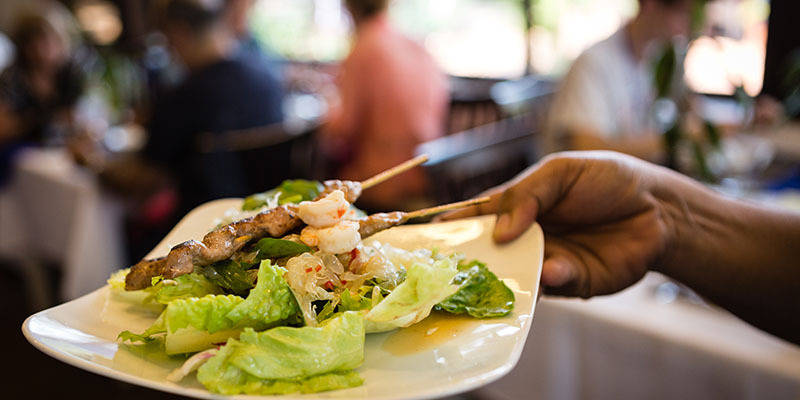 – The settlement should be by international bank transfer in advance, or (exceptionally) cash or credit card (Visa or Master card only), in Siem Reap – banking fees may be charged. Booking can be placed 1 day earlier in the low season (April – September), and 2 days prior during the high season (October-March). The event and activity could be combined with other tour, but please be sure that you will have your stay in Siem Reap at least 3 nights in order to complete your temple visit in Angkor area.